I am currently reading The Long Ride Home, and it is fascinating! As a parent who has tried some out-of-the-box therapies for my kids like listening therapy, interactive metronome, and Irlen filter glasses, I understand so much how exciting it can be to get results from something non-traditional. The effect horse riding had on Rowan is nothing short of amazing! Would you go to the ends of the earth to help your child? Writer Rupert Isaacson and his wife, Kristin, traveled to Mongolia, Southern Africa and Australia to seek solutions for their autistic son, Rowan. 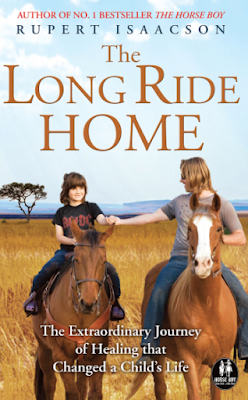 The Isaacsons’ amazing quest to help—and ultimately heal—Rowan, is captured in THE LONG RIDE HOME: The Extraordinary Journey of Healing that Changed a Child’s Life (Horse Boy Press; March 2016). Part thrilling adventure and part lyrical memoir, the book is a love letter from a father to a child whose gifts were waiting to be unlocked. It began with a horse. One day Rowan slipped away from his father and ran up to Betsy, a gentle mare who lived next door to their Texas home. Rowan’s instant rapport with Betsy, and the amazing effect she had on his behavior, inspired Isaacson to ride with his son. Isaacson, a trained rider, thought he had given up horses when his son was diagnosed with autism. As Rowan learned to read and communicate astride Betsy with his father, Isaacson felt an unexplainable tug of intuition. If he could take Rowan someplace that combined horses and spirituality, he could help him begin to heal. And what better place than the ancestral home of the horse, where shamans still practiced their craft—Mongolia. That’s when the adventure began. Going on faith and a hunch, the Isaacsons committed themselves to taking their intermittently incontinent, tantrum-prone son around the world. They travelled miles across the Mongolian steppes on horseback to meet a shaman whose odd methods brought amazing results. But the Isaacsons were warned: they would need three more healing journeys before any improvement became permanent. Pilgrimages to Southern Africa to meet the Kalahari Bushmen, as well as shamans of Australia’s coastal rainforest and the Navajo reservations of the American Southwest followed. Along the way the Isaacsons discovered how nature, movement and animals can help release children living on the Autism Spectrum from their most debilitating symptoms. THE LONG RIDE HOME combines Isaacson’s talents as an observer with a gift for breathtaking detail with the insight of his psychologist wife to create a portrait of hope that has resulted in The Movement Method, practiced around the world. It’s a story of love and the perseverance to find the child locked within the shell of autism and help him reach his full potential, a potential that may be a gift to the neurotypical world. RUPERT ISAACSON was born in London to Southern African parents. He is the author of The Healing Land, the story of his time with the San Bushmen of the Kalahari Desert and the adventure of helping them regain their ancestral hunting grounds; The Wild Host: The History and the Meaning of the Hunt, and The Horse Boy, the story of his quest on horseback across Mongolia to find help for his autistic son, which has been translated into 30 languages. Isaacson’s feature documentary, The Horse Boy, was screened on television worldwide and in American cinemas and his journalistic work has appeared in national newspapers in the United States and United Kingdom. A human rights activist for the Kalahari Bushmen, he also founded and runs The Horse Boy Foundation, which specializes in helping children learn and communicate through horses (The Horse Boy Method) and play equipment and the environment (Horse Boy Learning). For more information, visit www.horseboyfoundation.org.